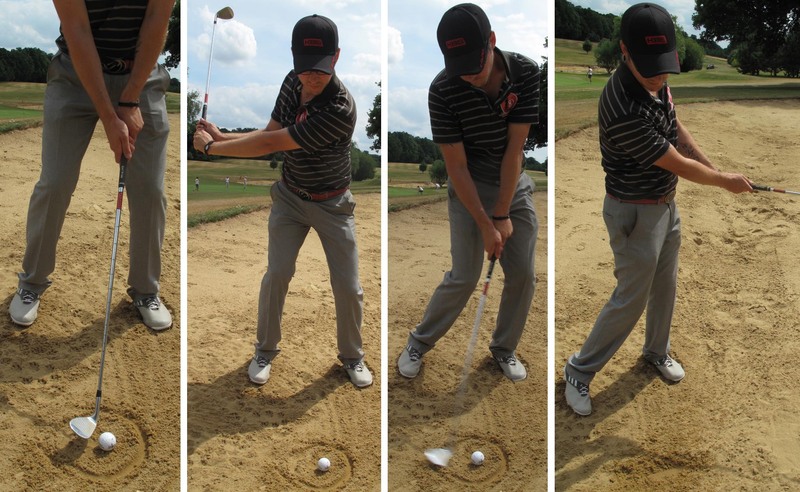 Here's a simple drill to stop you worrying about making contact with the ball and more about the sand. Firstly draw a circle around the ball with roughly a six-inch diameter - this will act as your target zone, and by the end of your follow through you want to have got rid of it completely. Set up with the ball slightly forward in you stance, allowing for your hands to be a few inches forward of your belt buckle. Take a smooth swing and only worry about bringing your hips through and getting rid of the circle at address. The more you focus on hitting the sand, the less chance you'll have of thinning the ball while always trying to finish the swing facing your target. Give it a go, you'll be surprised at where the ball ends up!